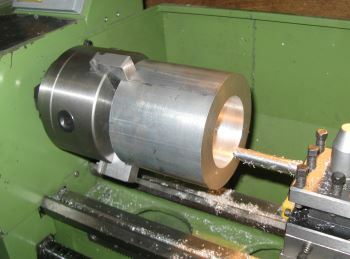 The tool that is held in a toolpost on the lathe cross-slide and which is feed into the rotating workpiece to machine it to size. Lathe tools are made from high speed steel (HSS), Tungsten Carbide or other very hard materials such as diamond. 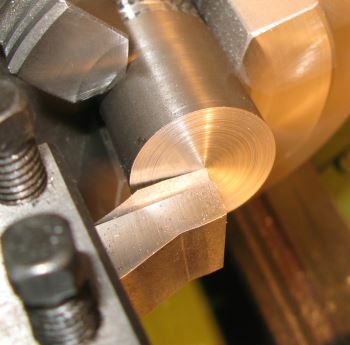 The cutting and clearance angles of a lathe tool will be dependent on the type of material they are to be used on and the required quality of finish. The shape of the tool in plan view is as important as all of the other angles and should be set according to the material being worked. The tool shown is suitable for roughing out the shape. The angle of the tool in plan view should be less than 90° if a step is required in the diameter of the workpiece. 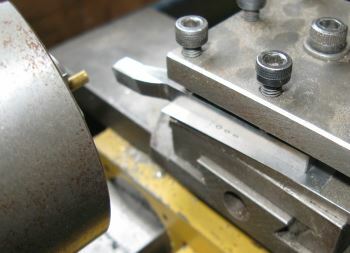 The nose radius should be kept large for roughing purposes, but may need to be reduced for finishing into the corner of a step. Increasing the rake angle on the side or back will produce a force that will draw the tool into the workpiece. The tool will tend to run and as such the cut will not be so controllable. It is important that the height of the tool tip is on or just above the centre of the workpiece. If the tool is too low the tool will be drawn into and under the workpiece and for small diameter material may result in them bending or breaking. The front clearance is there to stop the tool rubbing on the workpiece. 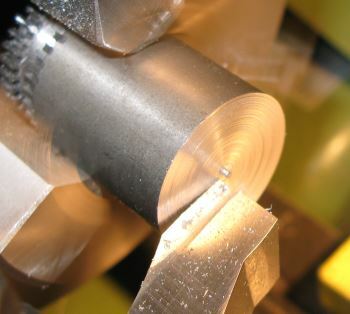 When machining some materials, of note is aluminium, some of the material may build up on the tip of the tool and so produce a new cutting edge. The result will be a poor finish. 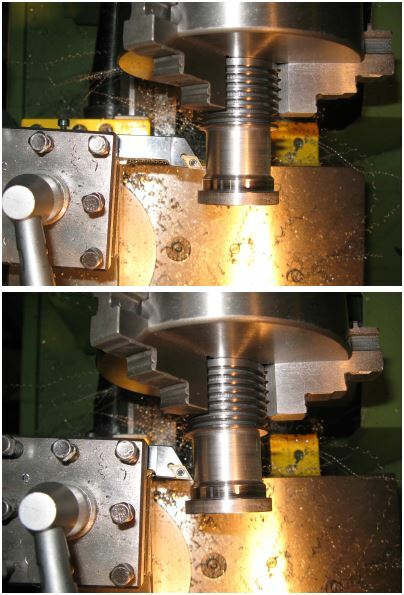 The flaring or tapering of a machined hole, usually made at the entrance end because of misalignment or spring of the cutting tool. 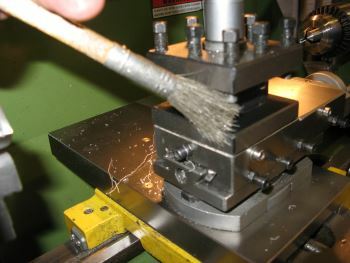 A boring tool is used to enlarge a cylindrical hole, sometimes the tool bit the boring bar and the tool holder are incorporated in one solid piece. The image shows a large piece of aluminium being bored using a 12mm boring bar that has a piece of tungsten carbide silver soldered to the end and then ground to shape. This bar has been a mainstay of my lathe tools for many years and normally just requires a light touch on the diamond lap stone to get an edge. The key with long boring bars is to take small cuts, the large overhang can result in a lot of chatter. Set up the lathe tool so that the very top edge of the tool is at centre height, you can do this by aligning the tool with a centre in the tailstock and then packing under the tool with shim. If the tool is too low then you will leave a “pip” in the centre of the bar when you face it. 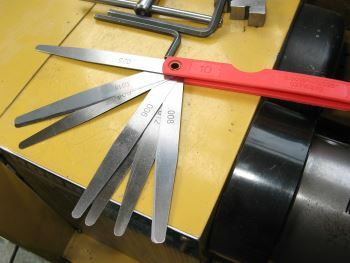 A set of feeler gauges makes a good starting set of shims. The image to the right shows the result when the tool is at the correct height. I use a mixture of brass, steel and aluminium shims. Thin brass shims are great to get the height exactly correct. With a larger lathe and so larger tool sections it is still useful now and again to use small tools. The Warco WM240B takes 12mm tool steel and this only needs a slight height increase to reach centre. Now and again I still want to use 6mm tools and for these occasions I have a piece of 6mm thick mild steel shim to bulk up the tool height in one step to match the overall 12mm tool height, then only one small shim is needed to get the final height exactly correct. 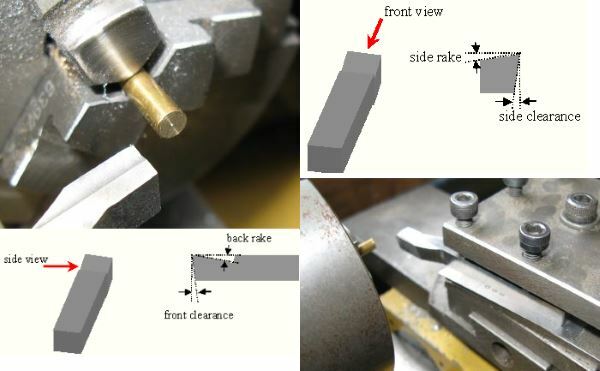 The image on the left with the small round bar being faced shows the tool has been set too low. If you want a varied selection of shims then quite useful to buy a set of feeler gauges and cut them down into a selection of shims. This will allow you to get the tool at exactly the correct height. 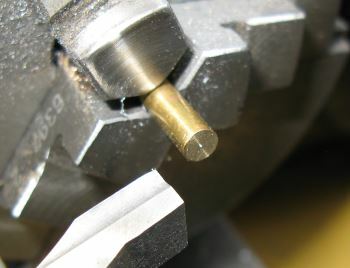 The shim is place under the tool. Be careful as you want the shim to cover the full length of the tool in the holder, or as a minimum the distance between the bolts that are used to lock the tool in place. If the shim is too short then there is a chance that tightening the tool down will cause the tool to tilt at an angle. You can check the tool height against a centre in the tailstock as this will be at exactly the correct height. Take your time to get the height correct as it will give you the best possible finish. Chatter marks on the workpiece are the result of vibration of the lathe, saddle, toolpost, tool or workpiece itself. Sometimes it can be very difficult to stop this from happening and I often find this is because I′m using the lathe at it′s limit of capacity or capability. Tool overhang can result in vibration, the upper image shows the tool has been located a long way out from the toolpost, shortening the overhang will increase the stiffness and so increase the frequency of any mode of vibration associated with the tool in cantilever. I’ve written a general article on Reducing Overhangs. The most common material for lathe tools is High Speed Steel (HSS). This is easily ground using a bench grinder and a final cutting finish can be achieved with a wetstone or a diamond pad. When starting to use a lathe it is quite useful to start with a pre-ground set of tools. Review: Soba 12mm HSS lathe Tools – At £45 for the 12mm set these are not cheap, but the quality is very high and if you want to get started with the lathe straight away and not have to learn the basics of tool grinding for a while then these are perfect. 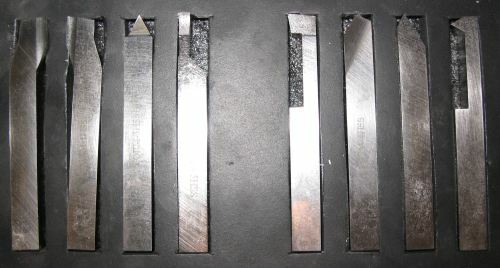 Finished Edge: I tend to grind the shape using a large bench grinder and then create a finished edge using a diamond pad. This also allows me to rapidly repair or clean up the edges of the tool using a diamond pad. The image shows the edge after being used for some time and then after being cleaned up on the diamond pad. A thin blade used to cut parts off. Also used for making grooves such as in pistons for rings to sit. Parting tools are normally just a couple of mm wide. The blade itself is deep to give it strength. When parting there is nowhere for the swarf to go and so there is a tendency for parting tools to jam. A quick brush of the tool post to remove any swarf is always a good idea as it has a habit of getting embeded in the shims otherwise. ….or it raises the tool slightly, moving off centre what was otherwise a good setting. The worst case is it gives an unstable tool that can break or damage the part you are turning.